The 82-year-old woman came to the clinic in Iquitos, Peru, complaining of blurry vision, headaches, and arthritis pain. Through a series of health history questions, WSU College of Nursing BSN student Olivia Cline discovered that not only had the patient dealt with these issues for two months, she had also been grieving the loss of her husband who passed away just before the onset of her symptoms. Cline provided the patient with pain medication, new eye glasses, and some much needed support as she continued to mourn the loss of her husband. 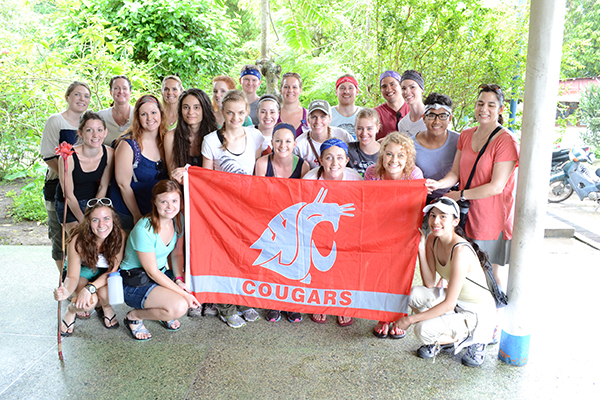 This past May, a group of WSU College of Nursing and pharmacy students set out to provide accessible health care to several communities in Peru, many isolated from modern medicine. In partnership with the nonprofit organization People of Peru, the team held clinic days, seeing as many as 160 patients in a day. Clinics were held in various settings and school was even canceled in order to provide space. While working in the clinics, students learned about global health care, addressing community needs, and what it means to provide basic health care to international communities. People of Peru provided the students with translators early on to help facilitate communication with patients and to complete environmental and community assessments. To discover the predominate needs of the community, students completed the assessments by asking residents about perceived barriers to health, such as access to clean water, healthy housing, and health care access. The assessments prepared students for the types of health issues they would treat in addition to identifying ways to spread the word about the clinics. The clinics meet a profound need for these communities. Ashley Haak, a ’14 BSN graduate, explained that some patients would walk an entire day from outlying areas to come to the clinic for medical attention. “They don’t always have the option to go to the doctor. Although the community may have a nearby hospital or clinic, the entire hospital staff often goes on strike because employees aren’t receiving pay,” Haak said. There is a private hospital nearby, but it’s not an affordable option for most. The young patient illustrated another barrier to receiving regular care. Because access to health care could be sporadic, many patients had chronic issues that couldn’t be fully addressed in one visit. Some patients required medications, procedures, or surgeries that the team was not equipped to provide. “We couldn’t always fix their problem, but we could give them advice on what they could do,” said Haak. Haak explained that each patient was educated on their condition and given overall health education. Students taught patients basic health habits such as personal hygiene to prevent urinary tract infections, proper oral care to prevent tooth decay, and adequate hydration. Depending on their condition, many patients were referred to physicians, sent to the emergency room, or connected with a surgery team that would be coming to Iquitos in the future. Some of the patients that visited the clinics didn’t necessarily have a medical complaint; they simply wanted to learn more about healthy living, taking vitamins, and to receive a general check-up exam. Beyond serving these communities, the students received more in return. Not only will the relationships and memories last a lifetime, so will the lessons learned from these communities as a student nurse. “This experience was a great opportunity going into my nursing career. I was able to see what it’s like to care for people in a community outside of America, and to see what it requires of you as a nurse. It’s a good time to reflect on your strengths and what you want to do as a nurse,” said Haak.